Everything is fake. Or at least it’s starting to feel that way. With the American campaign season still going strong, and the internet still, well... existing, we’ve been seeing a lot of suspicious photos in our social media streams. But don’t fall for any of these. They’re all fake. 1) Is this a Trump supporter after getting beat up? Recently protesters turned violent against Trump supporters at a rally in San Jose. And the conservative media have been posting photos of people injured in the clashes. Some photos, however, aren’t actually from the protests. The Twitter account Con_News posted the photo above claiming, “Here’s what happened to female Trump supporter when she met ‘peaceful’ and ‘tolerant’ liberals.” But it’s not from the protests at all. 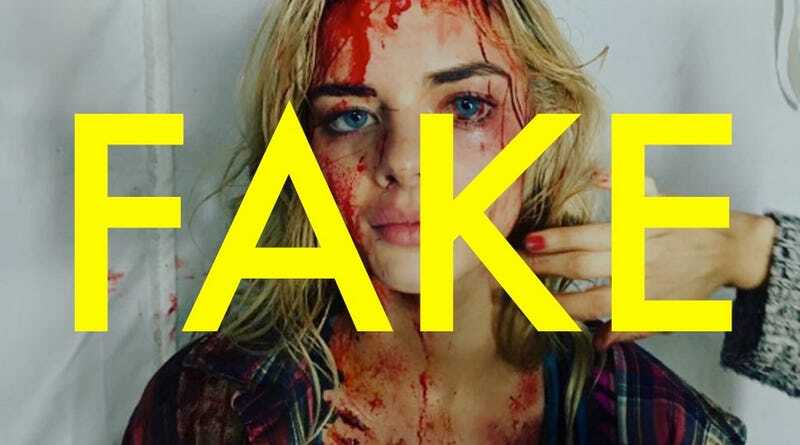 The photo actually shows Samara Weaving, an Australian actress from the series Ash vs Evil Dead. The “blood” is makeup, photos of which she posted to her Instagram back in January. Politics in America has certainly become violent (as it often does throughout history), but we have yet to see the Evil Dead plague infect the country. 2) Is this the moon peering through the “Eyes of God” cave? According to the Twitter account Life on Earth, this photo shows the “Eyes of God” from the Prohodna Cave in Bulgaria. The only problem is that the moon is 100 percent photoshopped. The cave is real, and you can find plenty of photos and videos of it online. But you’ll also find this completely fake image while you’re searching for it. This particular image, which shows the cave’s distinctive rock formations—which look like two large eyes and even a nose—is everywhere on the internet with headlines like, “20 Incredible Unedited Pictures That Border on Fantasy.” But this photo is the furthest thing from unedited. So, yes, it’s fantasy. 3) Is this a fugitive caught at the US-Mexico border? As photo debunker Hoaxeye points out, the photo was a re-enactment of a fugitive fleeing the US which was staged for photographers. As the photo caption at National Geographic explains, the photo was originally taken by Luis Marden circa 1939 in El Paso, Texas, though it’s not clear why the colors on this version appear more rich than the colors in the National Geographic archive, which appear washed out. It’s entirely possible that the photo has been both colorized (color film was rare in 1939) and tampered with by a number of different people since then. 4) Is this a 1960s ad for the birth control pill? 5) Is this a vintage photo of a burlesque dancer? No, that’s not a photo of a burlesque dancer, as so many people on Twitter would have you believe. Oldpicsarchive, which is arguably one of the worst OMGHISTORY Twitter accounts out there, has cropped the photo more tightly to give people less context. When you see the photo of the burlesque dancer below, you can clearly tell that it’s a much more modern photo. In fact, the photo is from 2015 and was taken by Jocelen Janon. 6) This this Trump supporters imploring people to Make America White Again? Sure, Donald Trump is arguably the most racist major presidential candidate that the United States has seen in half a century. But this photo of his supporters, supposedly making the phrase “Make America White Again,” is completely fake. The original photo appears below, where you can see the original “Make America Great Again,” fans. Trump is a certified racist, and many of his supporters may very well be too. But that doesn’t mean that you should be spreading fake photos around. 7) Is this Eddie Murphy eating steak off the back of a naked woman? Sometimes a photo comes along that’s so dumb that I wonder if it’s worth debunking. But time and again I’ve learned that there’s nothing too dumb for people to pass around as real. Take, for instance, this photo on the left. It’s allegedly actor Eddie Murphy eating steak off a model’s back. But it’s obviously not Eddie Murphy. And frankly I’m not even sure it’s a steak. As viral photo sleuth HoaxEye points out, the oldest publication of this photo online appears to be on a French website in 2007. And you can tell from the larger version of the photo that it’s definitely not Eddie Murphy. I mean, you can tell from a thumbnail as well, but c’mon people. Some of this stuff getting passed around is embarrassing. Also, I’m not here to judge, but eating food off of women seems a bit undignified for all involved. Grab her a chair and a robe, buddy—whoever you are. And see if she’d like some fries.